What to do if we fill the continuous ink system, and pages much ink is spilled. Because whenever we fill the tanks of our printer ink continuous ink system, the ink cartridge begins to pour across the page as it is printed. When we put ink pressure is applied to the ink cartridge, so we must remember that this happened. The following is how to solve this problem usually occurs in various ways, the pages appear with a constant line across the page, or spillage of ink at the end or top. This can eliminate taking a proportion of ink cartridge to remove ink cartridge must disconnect the ink cartridge system, through the holes in the top we get the ink cartridge. Syringe with the ink cartridge to be taken must be new or used before ink of the same color. 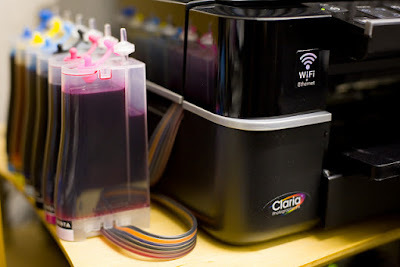 If you can plug the hose so that the ink does not return to the tank much better system, this is to avoid the hoses are filled with air, remember when you connect the system again bleed the ink system.